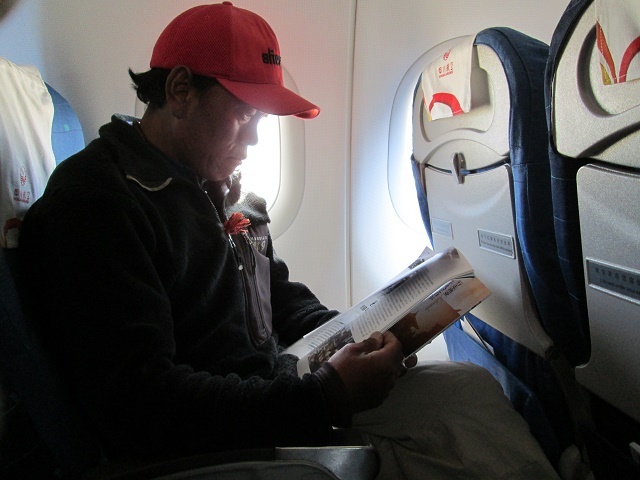 For Lhakpa it was his first international flight, so many things were new to him. It was nice to see how he explored the area, from the Duty Free section to the waiting room and later the airplane itself. 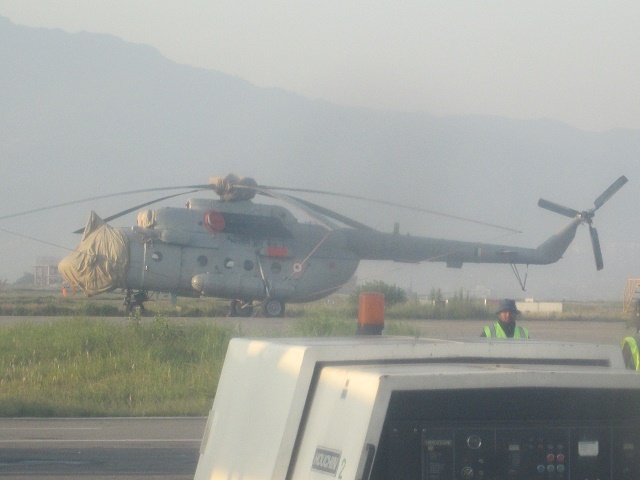 It was an Airbus 319, so definitely not a domestically used airplane in Nepal. 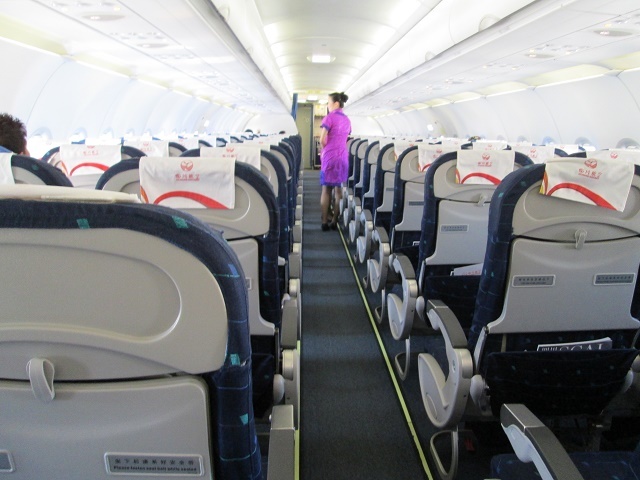 Once we took off in an almost empty plane, we both enjoyed the great view. 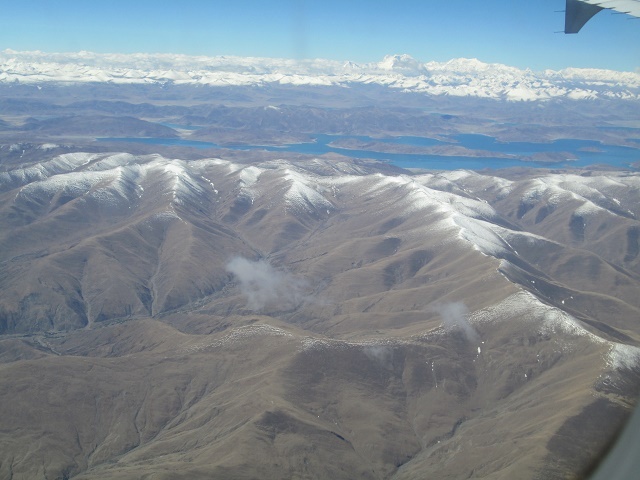 First we flew over the vast plains of Tibet, later the huge hills started and soon we were flying over there enormous Himalayas. 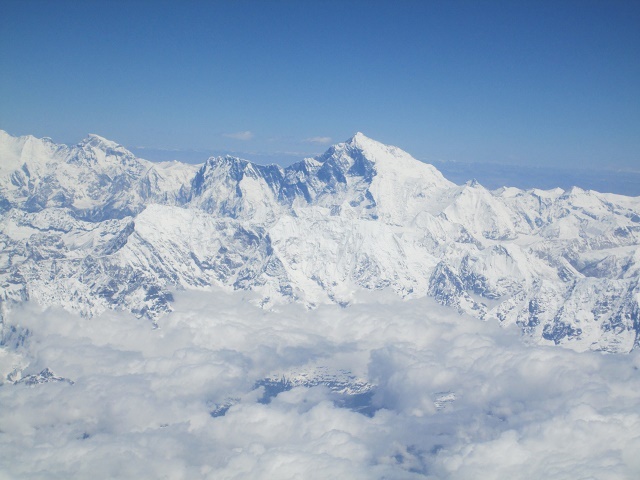 Last, but not least, we had a great view of Mount Everest, our climbing goal. What a great way to say a last time “Thank You and Good Bye” to Chomolungma! The last time for me, but not for Lhakpa. 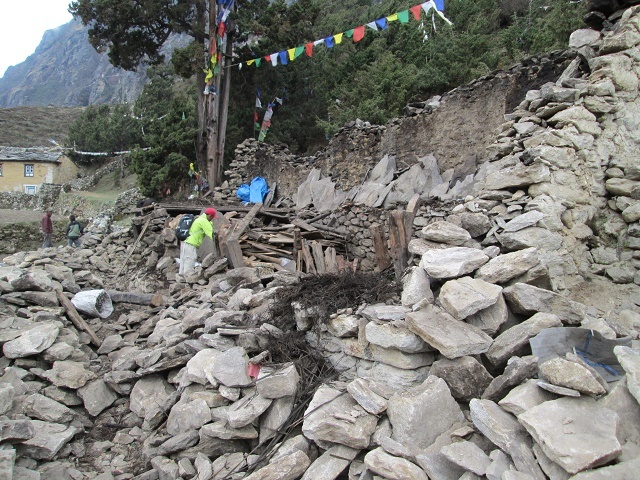 He told me already that he will need to work on many more Everest expeditions to pay for his damaged house. And all this after having summited Everest already 14 times! Yes, I will need to help him and his family even more. As we approached Kathmandu, I started to think about my personal journey, this time it was a journey into very unfamiliar territory: Flying into an earthquake area, entering a country in distress without any special visa, planning to fly, drive or walk to the Khumbu area and finally hike up to the village of Thame, one of the most damaged villages in this area of the Himalayas in Nepal, and of course, trying to “bring Lhakpa back to his family” and help them for a while. So many questions turned around in my head, but there was no answer at that point. But I knew, that one after the other of all these questions will be answered as soon as this plane will touch down in Kathmandu. And so it was… The touch down was great and as soon as we left he airplane we realized that this was not a normal situation at this airport. 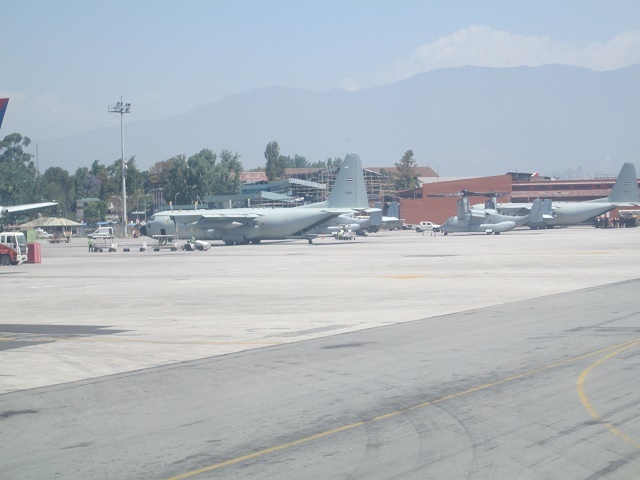 There were many huge air force transport planes and helicopters from different nations, numerous rescue teams in different uniforms and all kind of equipment was lying around in different parts of the airport. Once in the arrival hall, things were not so hectic anymore, especially since we were less than ten people entering the immigration section. My biggest question mark will now be answered in the next few minutes: Will the Nepal Immigration let me in? I filled out all the normal immigration paper work, added a picture and went to the immigration officer. And, believed it or not, I received a normal tourist visa and all this was done in a few minutes. 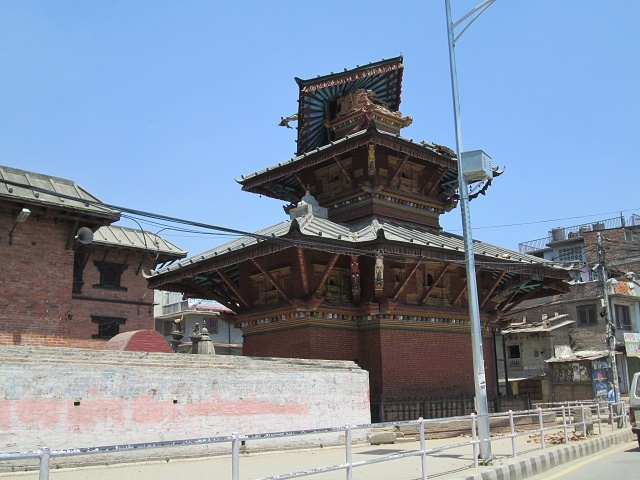 I was released and Lhakpa and I went to pick up our luggage and left the airport. 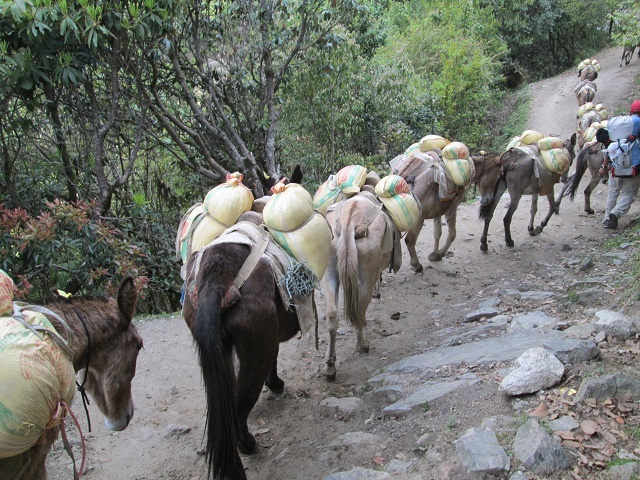 The plan was to leave the same day by small plane to Lukla. 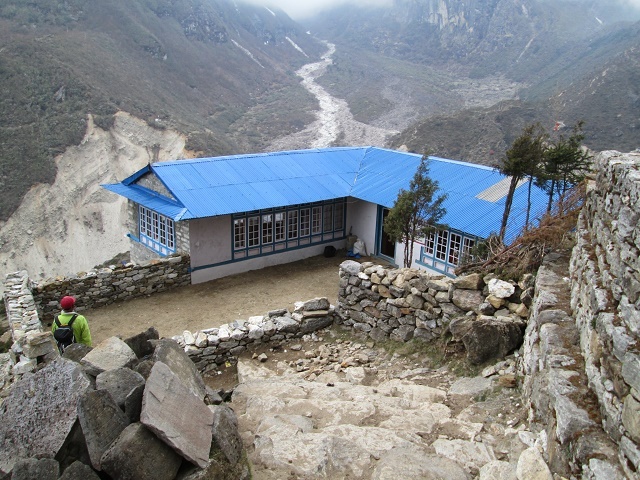 Unfortunately, I learned now that I needed a trekking permit (yes, that’s correct…) to help Lhakpa and his family in his home village. Trekking for pleasure were the last thing I was planning to do, but this were the rules and so we had to stay for one day in Kathmandu to deal with the formalities. The part of Kathmandu where we are staying was not damaged too much and I spent the rest of the day washing my clothes in the hotel room. They were still full of Everest dust and needed definitely some washing. Later, Lhakpa and I had dinner together and afterwards I spent the whole evening at the Bouddha, making my turns, thinking of all the people who are suffering in this city. 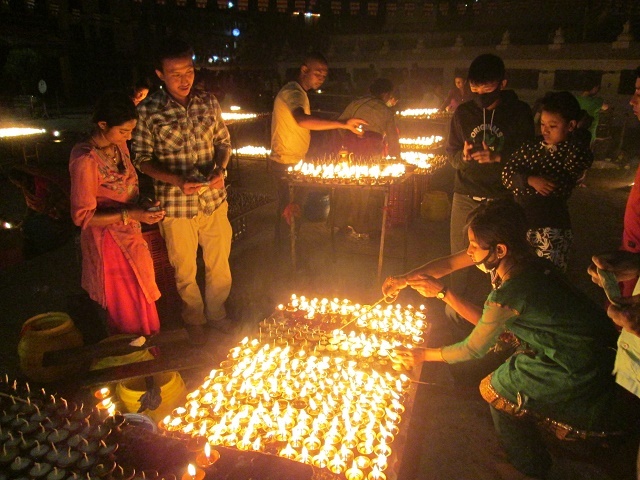 Later, I was lighting some candles for the loved once and the many people that have died because of the earthquake. It was a moment of deep reflection for me in a very special atmosphere and in the middle of hundreds of people who expressed their feelings in a deep Buddhist tradition. 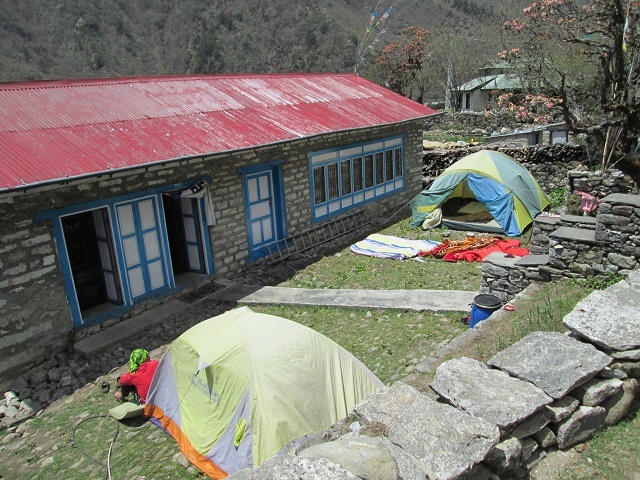 Later that evening I received a call that mentioned that everything was OK for both of us, flight tickets to Lukla and the trekking permit for me were ready and that I will be picked up at 5:00am at the hotel. That is just how it works in this countries, somethings you have to wait, but sometimes it is so efficient that you are just amazed. I was used to that from my time living in India but was still amazed how fast it worked again. This time. 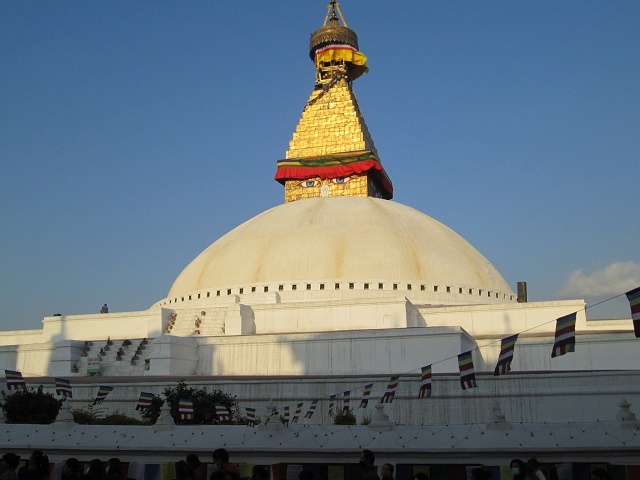 Of course, I was also glad to hear the good news since I was not eager to stay for too long in Kathmandu. 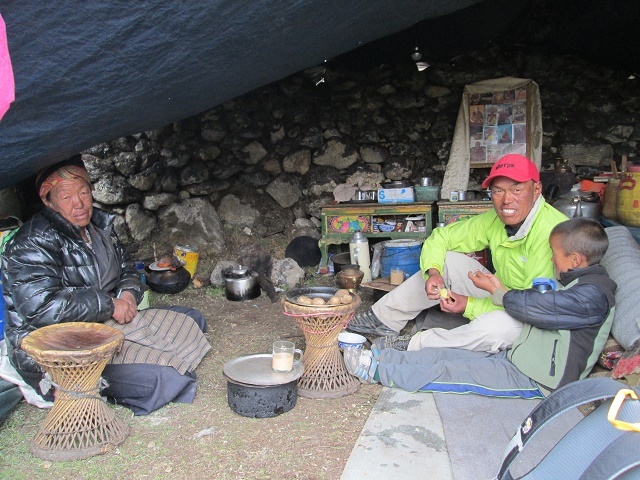 The next morning Lhakpa called me ten to five in the morning (he is always on time) and said that he is waiting. We drove with a taxi to the domestic airport and met our friend Geljen, who had arranged this flight for us. 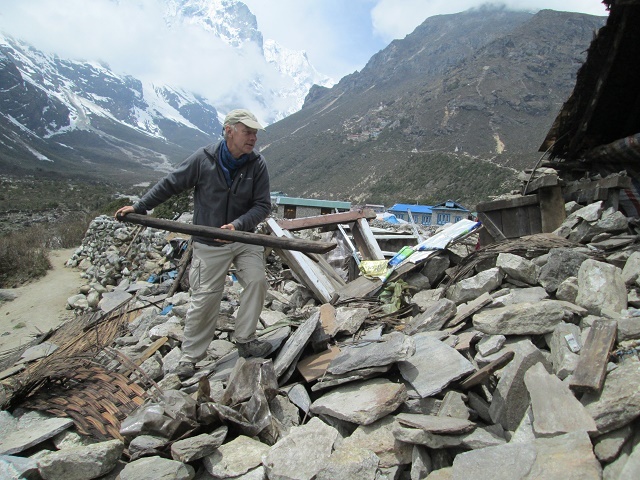 At the same time he was organizing a trip for six American doctors to go to the Khumbu area, so it was great to see him again there. 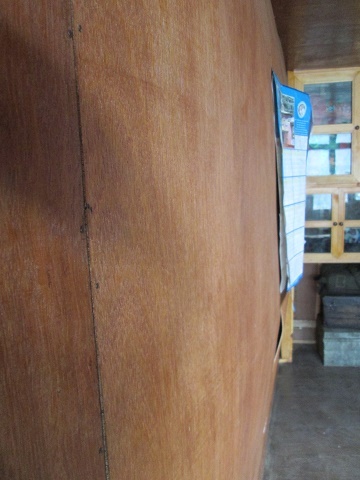 The airport was basically empty and we were the only passengers flying to Lukla. Well, who would fly into an earthquake area, if you don’t have to? 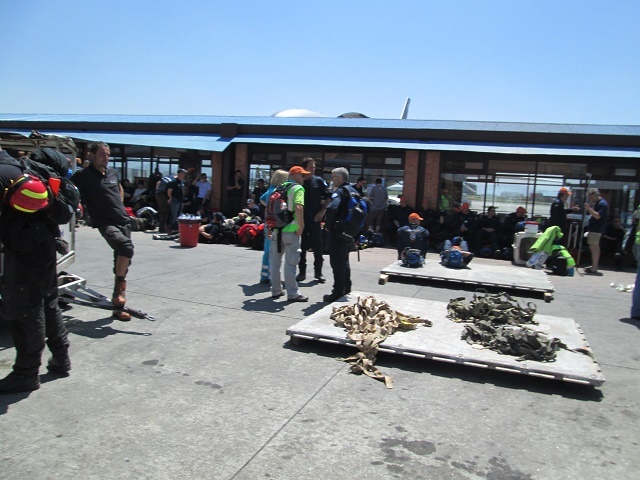 On the other hand, the planes coming back from Lukla, where packed with Everest climbers and trekkers who absolutely wanted to go home. 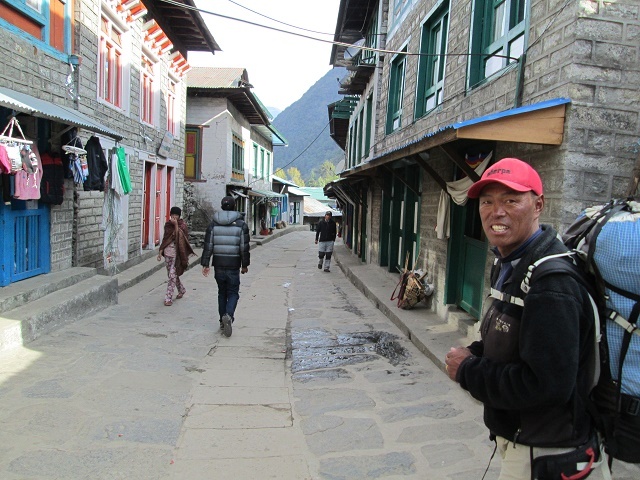 Once in Lukla, we took our luggage, had a short breakfast and off we were on the way to his family. Up to now, I had done many hikes and treks with Lhakpa in the Himalays, but this time I did expect that it would be a challenging hike for me, especially in terms of speed. Now he definitely wanted to go home and see his family and I was so happy that this will be possible already today. 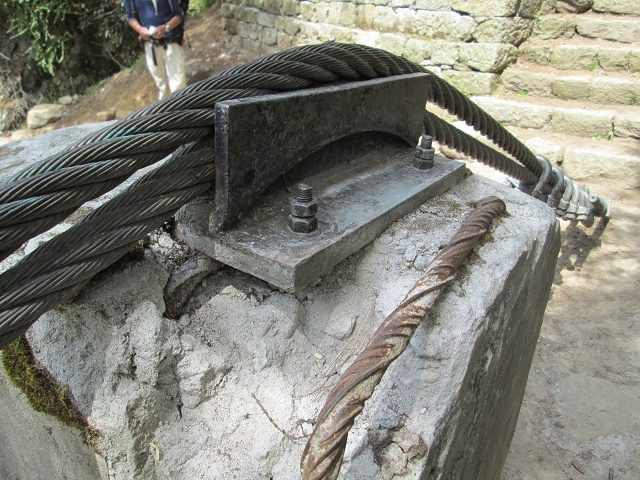 We left Lukla shortly before 7:00am and arrived in Namche Bazar after 3:00pm. This is normally a two-day hike and I could definitely feel my legs. This was not only long, it was also far and included an over 1,000m/3,300ft altitude difference. On the other hand, I was extremely happy that my first goal, “bringing Lhakpa home to his family” has basically been achieved. This idea started a long time ago in the Advanced Base Camp and it took many discussions and some extensive planning until it became rality. 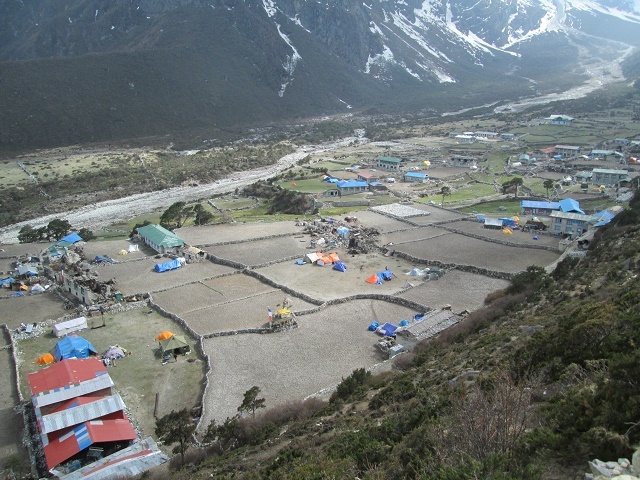 And after all the planning it was still a long way from the Everest North Side in Tibet back to Lhakpa’s home village in the Khumbu area in Nepal. 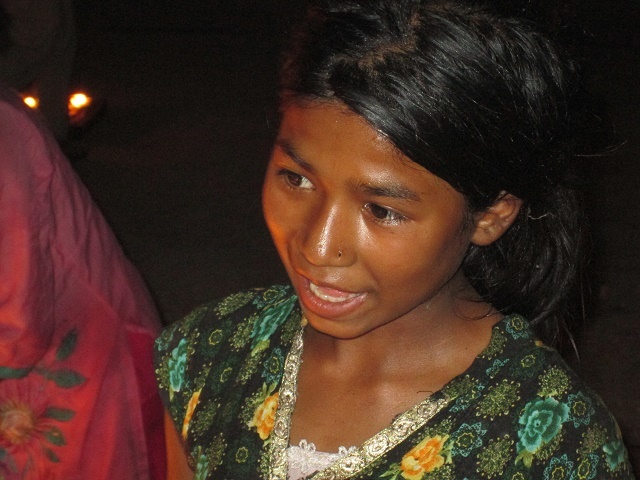 And, yes, it worked out despite the many obstacles and the terrible earthquake that hit Nepal so badly. 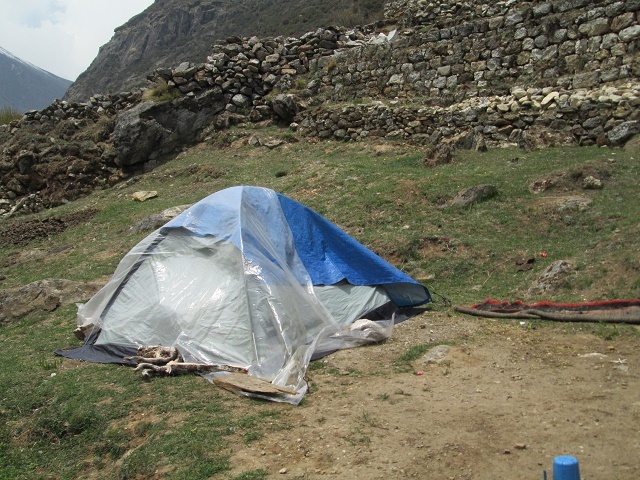 Once we arrived in Namche Bazar, I decided to stay here for one night so that Lhakpa could meet his family in privacy after such a long time. 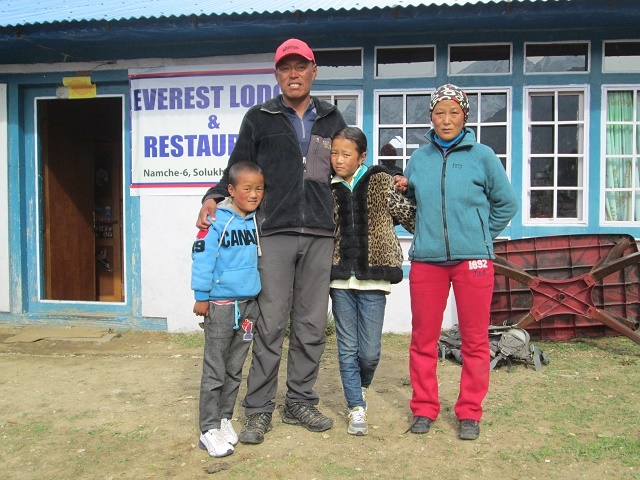 His family lives only about 1 ½ hour hike from here (Sherpa time – I need over two hours…) and is situated at about 3,600m/11,900ft. I called him later in the evening and I realized that he was happy to be back home. 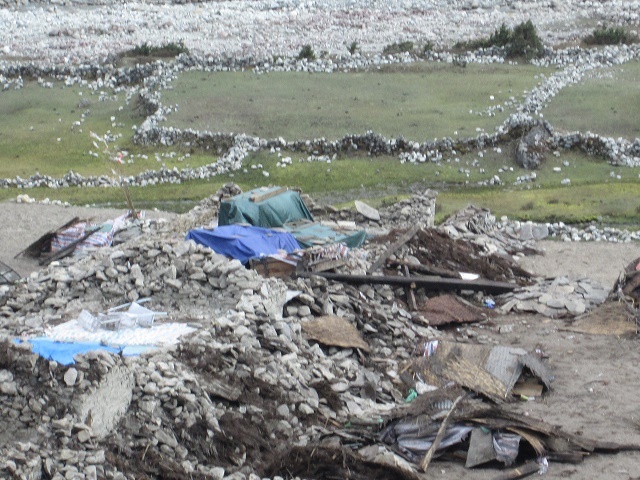 This was a long and physically and mentally hard day for me, and I fell asleep early that night and was very happy with the first outcome of my plan: Uniting a Sherpa family after a great natural disaster! 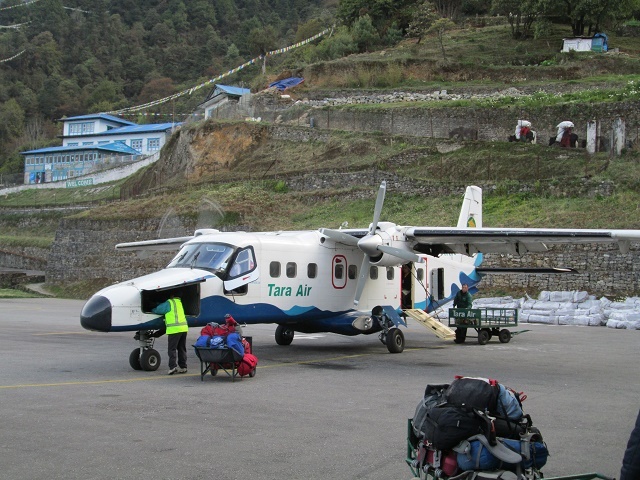 Arriving and turn around in Lukla with one engine running – This time with a Dornier 228. 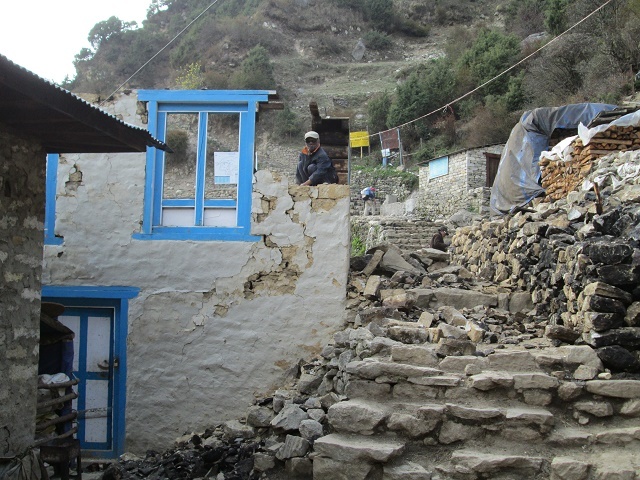 The next morning I left Namche Bazar around 9:00am and hiked slowly towards Lhakpa’s home. I know the way since I had spent about two weeks here before the Everest expedition. I was so excited to see him united with his family again so that I had at times tears in my eyes on the way up to the village. Finally, about two hours later I arrived in their house, saw them all together and this time, I could not hold back my tears. I felt extreme happiness for a short moment… They invited me for a tea and later we all had lunch together. 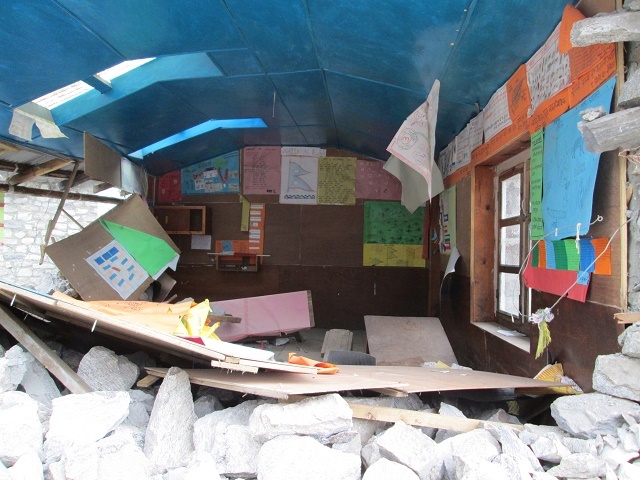 Later on Lhakpa showed me the damage from the earthquake on his house. 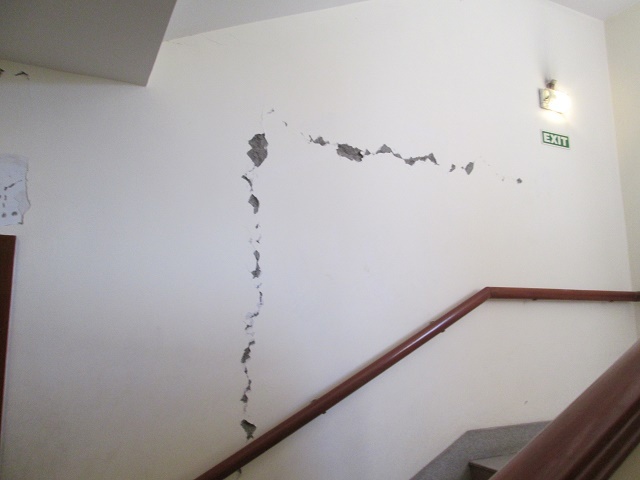 The house looks relatively good (compared to others), but unfortunately, more than half of the house cannot be used because of cracks in the walls and some of the walls are leaning inwards. It is too dangerous to live in such a house so the whole family sleeps in a tent. The only part of the house that seems to be OK at the moment is the kitchen. The rest is “off limit”. What a sad situation this is and I realized that he will need specialist to fix the walls. In fact, it looks that they will have to be destroy and rebuild many of the walls in order to make the house secure again. This will be a long and expensive process. I felt so bad for the whole family and decided for myself to sponsor a certain amount for the reconstruction later on. There was nothing more I could do for this house at the moment. Later on we hiked up to Thame, the village he grow up. 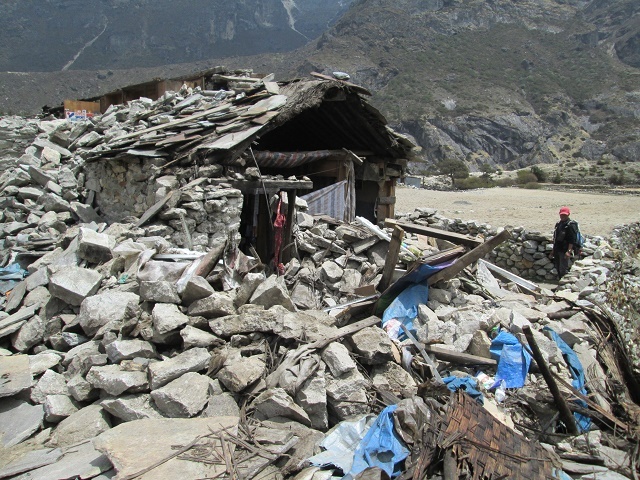 Thame, at 3,800m/12,500ft, is one of the most damaged village in the Khumbu area because of the earthquake. 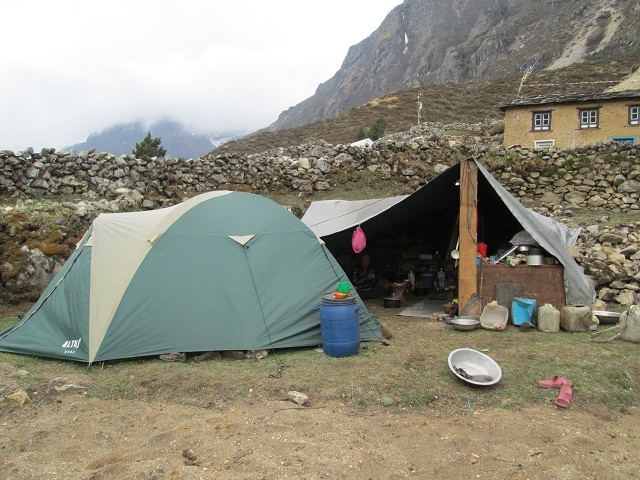 Lhakpa’s mother lives here and he has many relatives in the area. What I saw there was so terrifying and heartbreaking that it took me a long time to realize that this was reality. 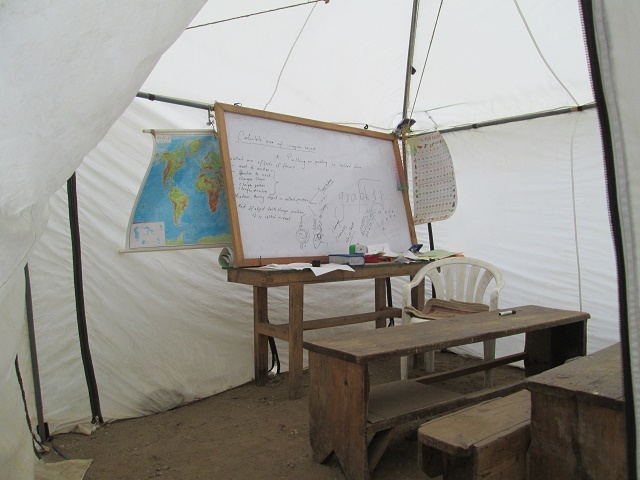 So many houses were destroyed and most people lived in tents or under simple emergency shelters, basically simple blankets… It is not possible to describe the feeling I had at that moment. 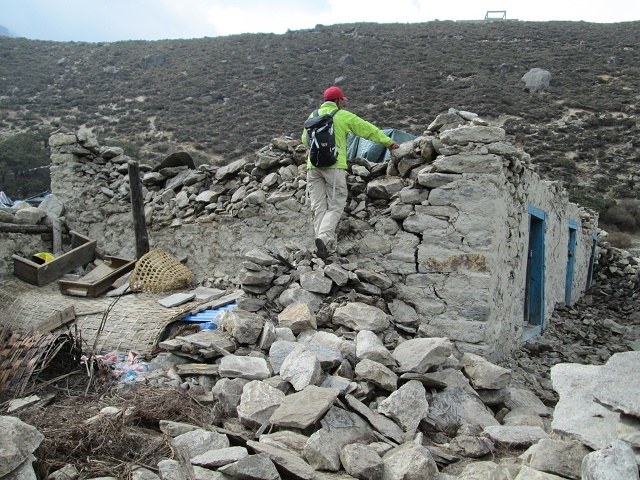 We started to walk around and Lhakpa showed me a house, or more precisely a pile of stones that used to be a house, of one of his relatives. Indescribably… Next, we walked to his parent’s house where his mother still lived until the earthquake. This time I was not able to hold my tears back. The house is totally destroyed and his mother lives in a temporary shelter, on the ground, and invited us for tea and boiled potatoes, as would this be the most normal thing in the world. Unbelievable! 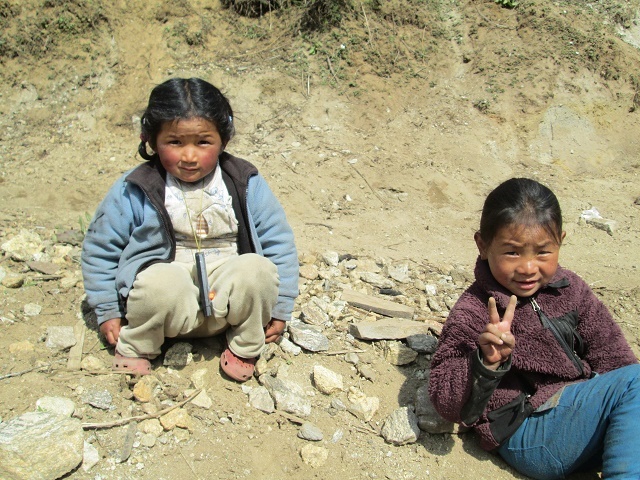 The Sherpa people are physically and mentally extremely strong and it seems to me that they are so closed to nature that even a disasters as huge as an earthquake cannot move them from their path. I felt so bad for Lhakpa and his family and all the people that suffered here that I needed some time to process my feelings and observations. 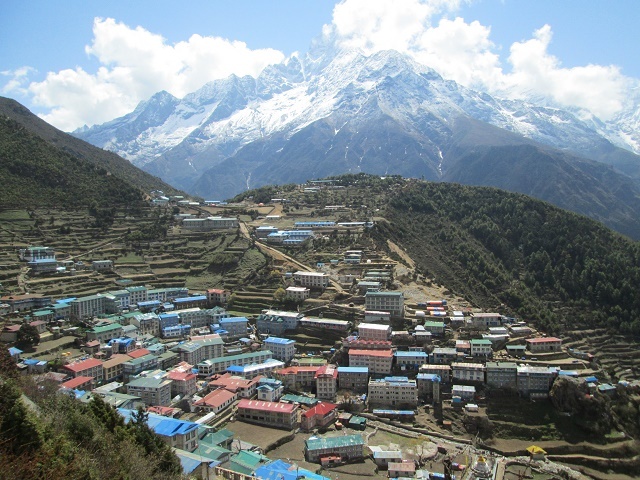 I informed Lhakpa that I will walk back to Namche Bazar that evening and spend the night there. I needed time for myself before I could try to be helpful for this wonderful family. So I walked back, in the dark, on a relatively dangerous trail, and all my thoughts where with the people of Thame. 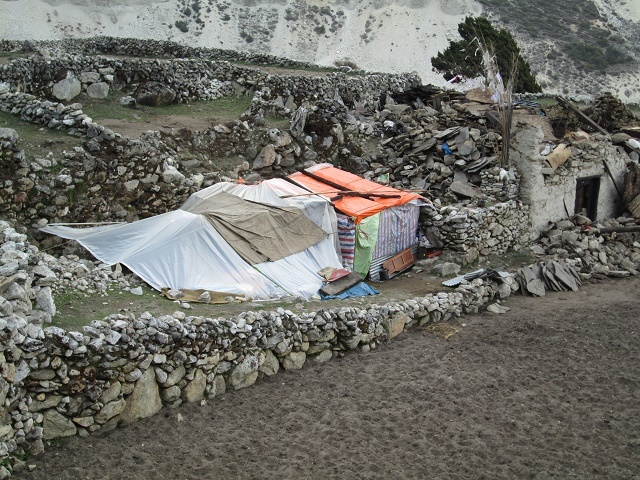 Once I arrived in Namche Bazar, I made the decision, to go back to Thame, sleep in a tent, like many families do, and help as much as I can, even if it is only moving away the debris and remains of their houses… What a sad experience! Trying to clean up – Where do you start? From now on I will be in the high villages in a tent and will have no access to the Internet. 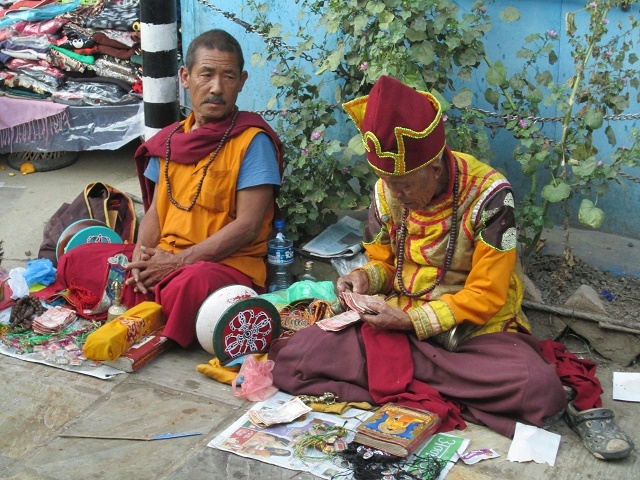 Once in a while will walk down to Namche Bazar to check my mail and, if possible, update my blog. I hope that all of you understand that my journey is not quite finished yet. In this context, I wish all of you a happy and wonderful Spring! 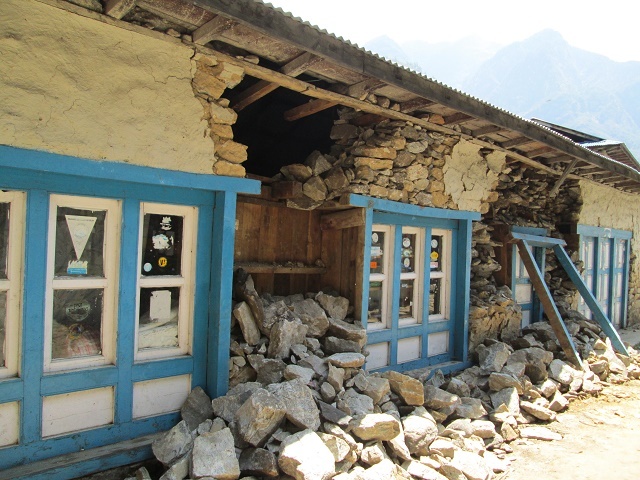 A second earthquake stroke yesterday, on May 12, at 12:55 local time, in the village of Namche Bazar in the Himalayas were I was staying at that time. 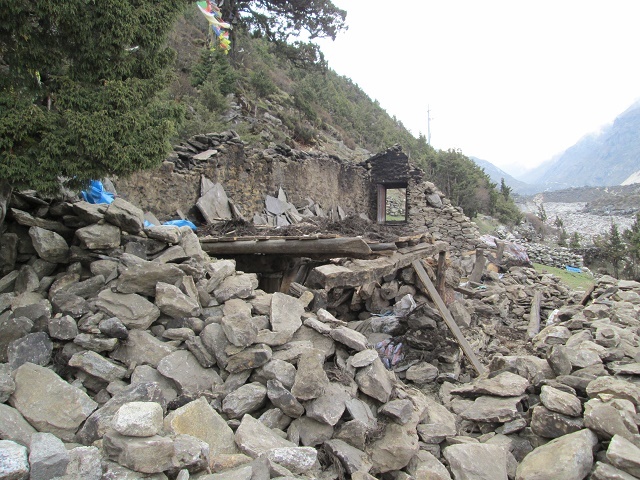 It was terrifying for all of us, but the good news is that nobody in this village got hurt. 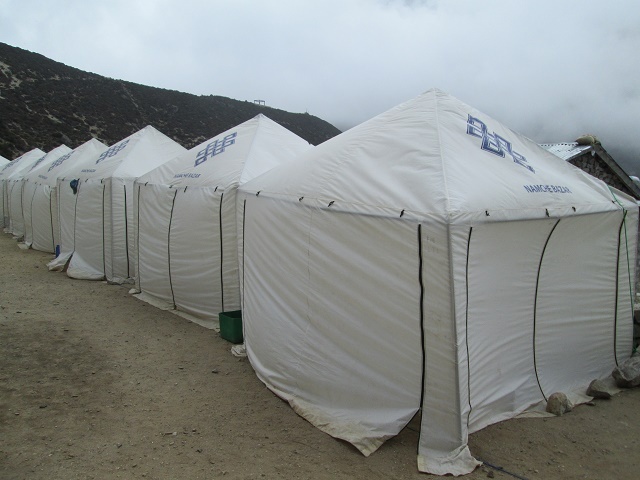 We are all fine and the whole village sleeps now in tents on the highest and safest point in the area, probably for a week or so. 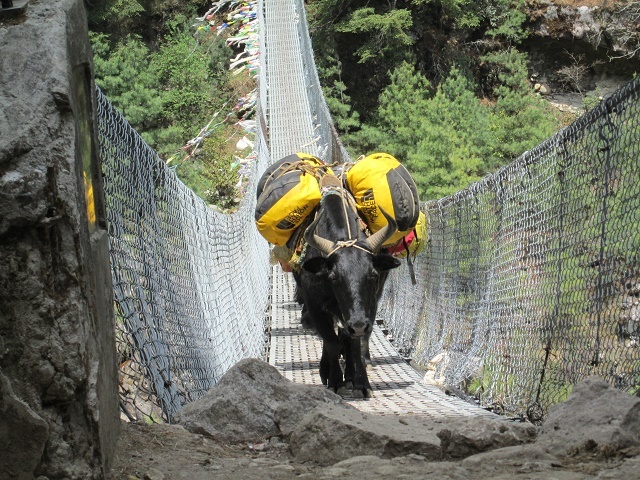 The Sherpa people are really close to nature and seem to be able to adapt to any natural disaster in a very fast and efficient way. 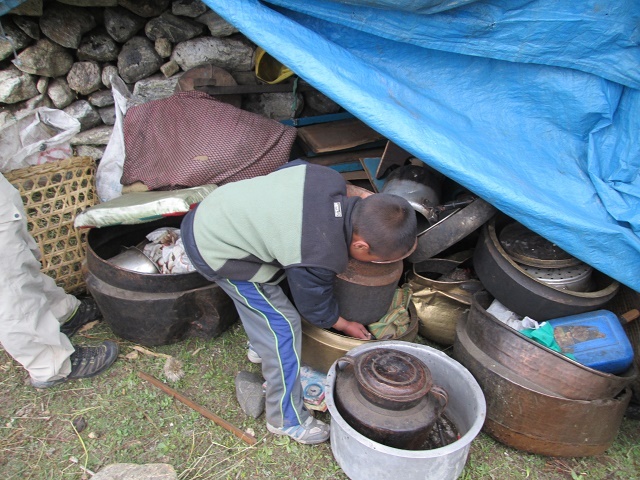 It is really impressive to see how they cope with these very difficult circumstances in these high mountain valleys. There is a lot we could learn from them!. The other good news is that Lhakpa and his whole family is also fine. 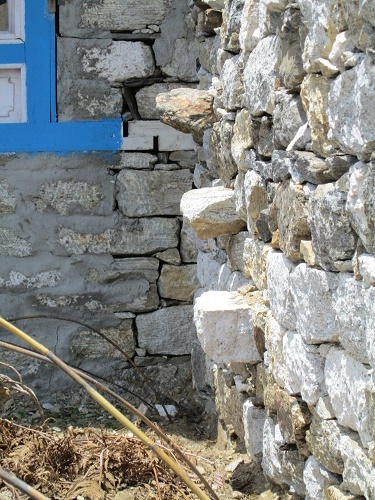 He got a lot more cracks in his house, but the walls are still standing. In terms of my journey, I will have to wait a few days until things calm down a little bit here. Once the trails are safe again I will see were the journey will bring me. But the good news is I am fine und healthy and in good spirit. Thank you again to all of you for your wonderful support!